Ovarian cancer attacks the female reproductive system and unfortunately, it often goes undetected until it has spread within the pelvis and abdomen. At this late stage, ovarian cancer is more difficult to treat and is frequently fatal. Early-stage ovarian cancer, in which the disease is confined to the ovary, is more likely to be treated successfully. Surgery and chemotherapy are generally used to treat ovarian cancer. Epithelial tumors: About 90 percent of ovarian cancers develop in the epithelium, the thin layer of tissue that covers the ovaries. This form of ovarian cancer generally occurs in postmenopausal women. Germ cell carcinoma tumors: Making up about five percent of ovarian cancer cases, this type begins in the cells that form eggs. While germ cell carcinoma can occur in women of any age, it tends to be found most often in women in their early 20s. Six main kinds of germ cell carcinoma exist, but the three most common types are: teratomas, dysgerminomas and endodermal sinus tumors. Many tumors that arise in the germ cells are benign. Stromal carcinoma tumors: Ovarian stromal carcinoma accounts for about five percent of ovarian cancer cases. It develops in the connective tissue cells that hold the ovary together and those that produce the female hormones estrogen and progesterone. The two most common types are granulosa cell tumors and sertoli-leydig cell tumors. Unlike epithelial ovarian carcinoma, 70 percent of stromal carcinoma cases are diagnosed in Stage I. Small cell carcinoma of the ovary: Small cell carcinoma of the ovary (SCCO) is a rare, highly malignant tumor that affects mainly young women, with a median age at diagnosis of 24 years old. The symptoms are the same as other types of ovarian cancer. Make an appointment with your doctor if you have any signs or symptoms that worry you. If you have a family history of ovarian cancer or breast cancer, talk to your doctor about your risk of ovarian cancer. Your doctor may refer you to a genetic counselor to discuss testing for certain gene mutations that increase your risk of breast and ovarian cancers. Blood tests. Blood tests might include organ function tests that can help determine your overall health. Your doctor might also test your blood for tumor markers that indicate ovarian cancer. For example, a cancer antigen (CA) 125 test can detect a protein that’s often found on the surface of ovarian cancer cells. These tests can’t tell your doctor whether you have cancer, but may give clues about your diagnosis and prognosis. Surgery. Sometimes your doctor can’t be certain of your diagnosis until you undergo surgery to remove an ovary and have it tested for signs of cancer. Once it’s confirmed that you have ovarian cancer, your doctor will use information from your tests and procedures to assign your cancer a stage. The stages of ovarian cancer are indicated using Roman numerals ranging from I to IV, with the lowest stage indicating that the cancer is confined to the ovaries. By stage IV, the cancer has spread to distant areas of the body. Surgery to remove one ovary. For very early stage cancer that hasn’t spread beyond one ovary, surgery may involve removing the affected ovary and its fallopian tube. This procedure may preserve your ability to have children. Surgery to remove both ovaries and the uterus. If your cancer is more extensive or if you don’t wish to preserve your ability to have children, your surgeon will remove the ovaries, the fallopian tubes, the uterus, nearby lymph nodes and a fold of fatty abdominal tissue (omentum). Chemotherapy: Chemotherapy is a drug treatment that uses chemicals to kill fast-growing cells in the body, including cancer cells. Chemotherapy drugs can be injected into a vein or taken by mouth. Sometimes the drugs are injected directly into the abdomen (intraperitoneal chemotherapy). Chemotherapy is often used after surgery to kill any cancer cells that might remain. It can also be used before surgery. Targeted therapy: Targeted therapy uses medications that target the specific vulnerabilities present within your cancer cells. Targeted therapy drugs are usually reserved for treating ovarian cancer that returns after initial treatment or cancer that resists other treatments. Your doctor may test your cancer cells to determine which targeted therapy is most likely to have an effect on your cancer. 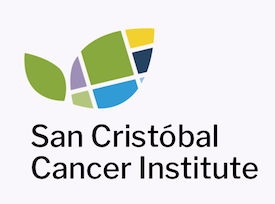 If you’d like to learn more about Ovarian Cancer through our San Cristóbal Education Resources, attend our events or learn about our Cancer Center, please contact us.